Abalon has been replacing concrete, block and preserved wood foundation (PWF) walls in the Calgary area since 1987. Abalon has experienced estimators that can provide full all-inclusive quotes for your project. Our crews are well trained in working with existing structure above them while they work. Abalon can do the job on time on budget and to your satisfaction. With 1000 of wall replacements under our belt, we have the experience and skills to be at the top of our game. What sets us apart from others in our industry? The fact you can live in your home while we do all the work. Abalon Project Managers carefully orchestrate the replacement in stages. This allows for a safe working environment and a logical process for all involved crews to get the job done on time. Abalon will obtain all the necessary engineering, drawings and permits required for your project. We coordinate will all the trades required from the electricians to the plumbers for a success smooth production. 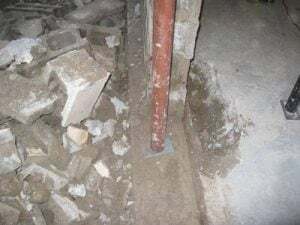 So if you have a foundation wall that is falling apart or you want that extra bit of head room in your basement we can accommodate your needs. My basement has no head room. I would like 9 foot high ceiling, can Abalon do this type of work? Yes. This is our number one request. We can come out and give you some ideas and provide you with a written quote to perform this work. I have a full basement on the original part of my house but we had an addition added. It only has a crawl space, can you turn that crawl space into a full height basement space? Yes. We will install a new footing and wall under the existing crawl space walls, remove the soil and put in a new floor at the new elevation. All while you remain in your home, that’s the best part. Abalon has built its reputation on foundation wall replacements. We have the leading industry team of estimator’s, supervisors and crew members. Abalon will complete your project on time on budget and to your total satisfaction. Trust us – we will put a smile on your face. Call Abalon today!